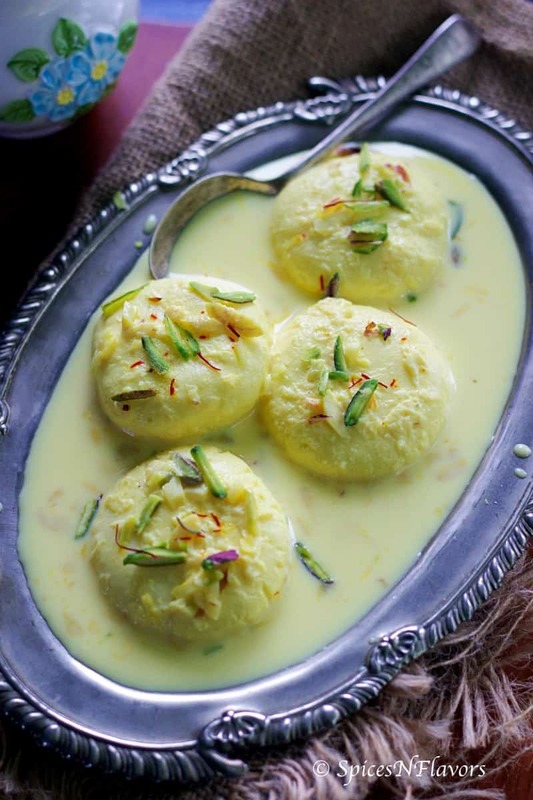 Rasmalai – One of those soft and spongy royal Indian dessert; a rich Indian cheesecake made without a crust. 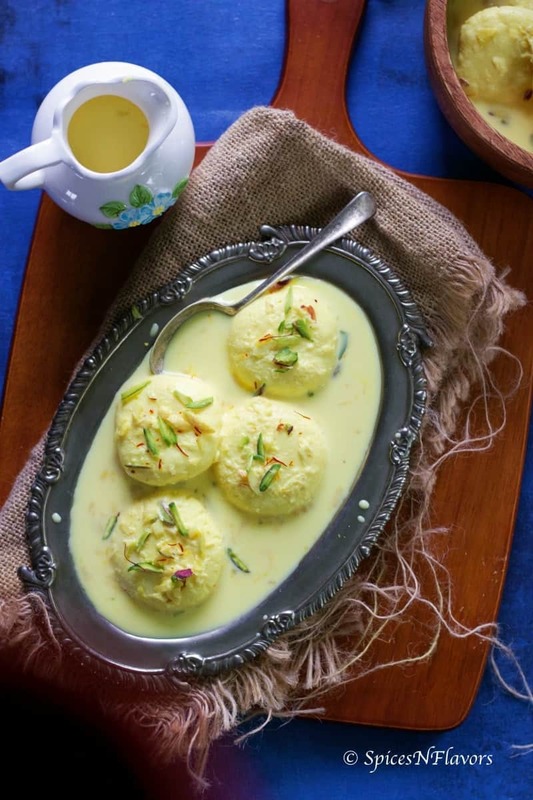 Rasmalai recipe is one of those intricate Indian sweets that most of us are intimated to try it at home. But to be honest with you all with just basic steps or tips this can be tamed or mastered easily. Making Rasmalai at home is time-consuming; again I would be sharing some techniques to get it all done and dusted easily. Let me be honest with you all.. I have made this Rasmalai before; not exactly like the traditional ones but a different malai sandwich with so many components and plating – Malai Sandwich with Kesar Mousse and Cardamom Crumble. That was one amazing plated desserts that I have made. The point is at that time; call it a beginners luck I got it just perfect. 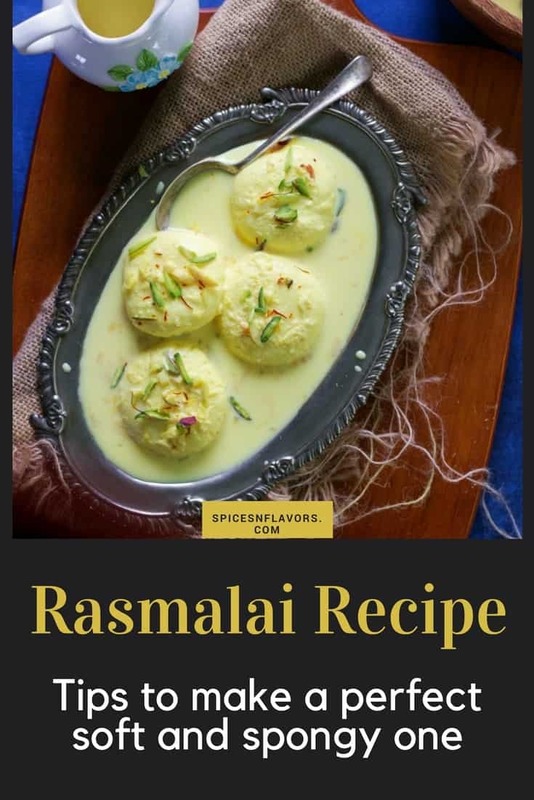 Now when I started to make it again I was stuck, made some mistakes and that is when my dear friend Dhwani from Cookingcarnival.com shared these tips through which I could make such soft and spongy Rasmalai. Thank you Dhwani. And that is what exactly I am gonna share with you all in this Rasmalai post. The “ras” of the rasmalai is pretty basic. 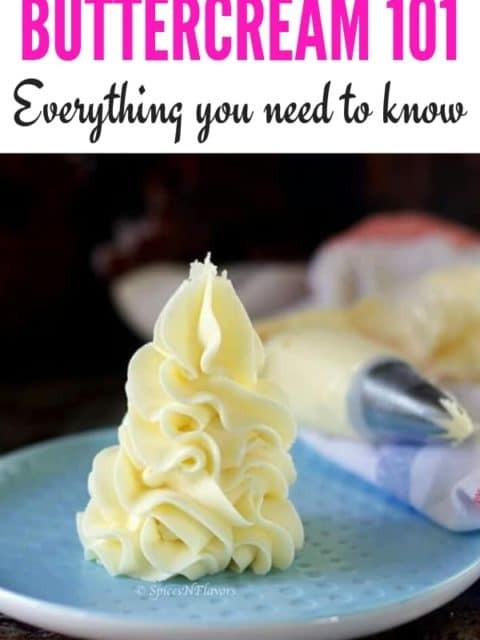 Kind of similar to the Kulfi recipe that we just made a few days back. The only catch is we have to cook it just until it reduces to 50% of original amount. So it was not a big deal for me. But it so happened that in my first trial, even after hanging the paneer for 30-40 mins it was still wet and when I tried to knead it turned even mushy instead of coming together as a soft dough and so I had to repeat the process. I know exactly where I went wrong and hence sharing the tips and tricks with you all so that you do not make that mistake. 1. Do not reduce the ras for the malai way too much; that is, do not make it thicker. The thinner it is the easier it would be for the paneer (rasgulla) to absorb it. If its thick the ras (sweetened milk) won’t be able to penetrate the paneer balls. 2. Allow the milk to cool a bit say about 70% to 80% before adding the vinegar or lemon juice to split it. 3. Once the paneer splits, stop the cooking process by adding ice-cold water. Would stop it from cooking further and turning rubbery. 4. Separate the paneer out from the whey. Squeeze the excess water completely. Hang it for a while to ensure that the paneer is dried out. This is one of the crucial step. The paneer should be completely dry. (Check out my video recipe to see the texture of dried out paneer). This is where I went wrong. 5. The next important step to this recipe is to knead the paneer really well. And I have another tip for you guys to make your life easier. Use a blender/mixer for this step; this would definitely a boon and you guys can thank me later.. 😛 anyways what I mean is use the “Pulse” mode on the mixer for 5 to 6 mins and in just a matter of 2 mins your perfect paneer dough would be ready. 6. The sugar syrup for cooking the paneer balls should be boiling when you are ready to add the balls. 7. Once the paneer balls are cooked; do not open the lid of the vessel or cooker instead just let it cool completely in the sugar syrup itself. Open the lid only when it has cooled completely. 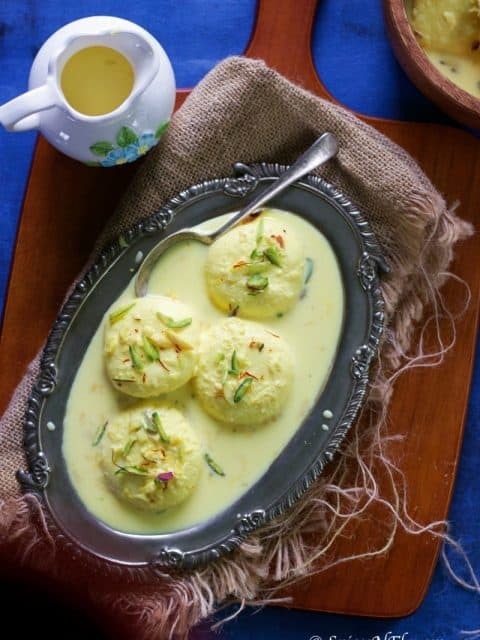 Rasmalai is a royal Indian dessert wherein the smooth, soft and spongy paneer balls are dunked in a rich and sweetened milk. At this stage add the saffron, nuts, cardamom powder and yellow food colour to the Ras - sweetened Milk. Allow this to cook and reduce to half of the original amount. Do keep stirring in between. In another 10 mins you would observe that it has reduced significantly, at this point add the sugar. Mix everything well and allow it to cook for another 5-6 mins. You do not want to thicken the milk; it should be of thinner consistency only. Switch off the gas and allow this to cool completely. Bring the 1.5 litre milk to rolling boil on med flame. Once boiled switch off the gas and allow it cool a bit. At this stage add in ice-cold water to stop the cooking process. Filter this out onto a cheese cloth. (Collect the whey and use it to make chapati dough, dal, kadi etc). Gather the ends of the cloth and squeeze it to release all the excess water. Tie a knot and hang it somewhere to allow the excess water to drip off completely say another 15-30 mins. Once the paneer is dried out, take it out onto a blender and using the pulse functionality pulse it to form a paste smooth dough. In a wide mouth pan, bring the sugar and water to rolling boil. Add the prepared flattened balls one by one, cover with the lid and allow it to cook for 15 mins until it absorbs the liquid and bulges increasing in size. 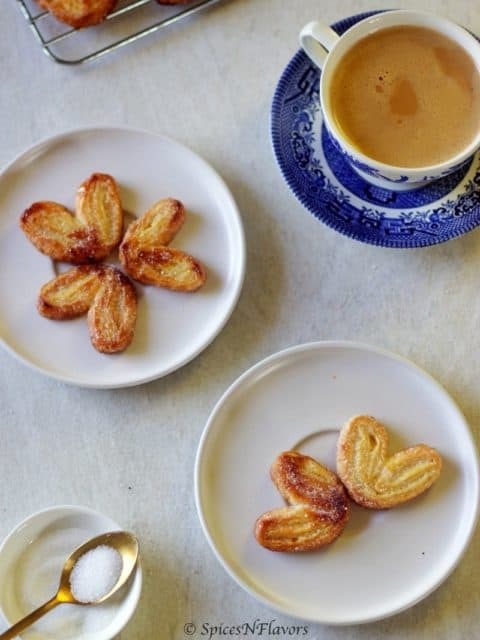 Switch off the gas, and let it cool completely in the sugar syrup itself. Once cooled, squeeze out the excess sugar syrup and transfer the cooled ras - sweetened milk. Let it sit for 2-3 hours until the balls absorb the milk. Do check all the tips mentioned above. Apart from that, as per the recipe of the Ras – sweetened milk that we are using here, it would give you more milk than the balls. We like to have the proportion of liquid more but if you do not prefer that way you can halve the measurements and use. IF you found this post informative then share it with me by tagging me, tweeting me or instagram me. I would love to follow you and yours posts. Hi. I tried this n the ras malai turn out perfet. 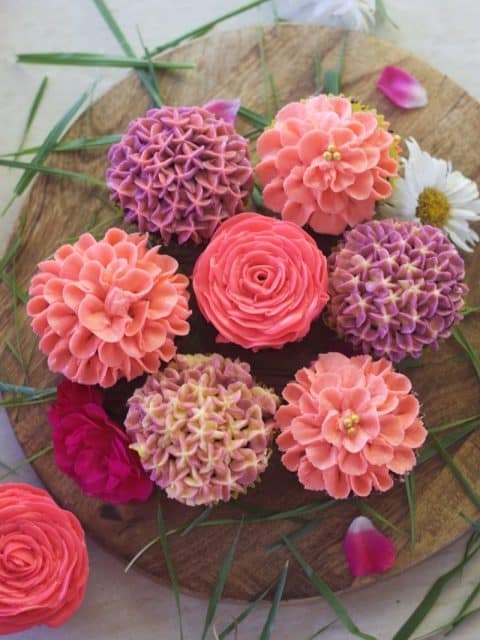 Thank u for recipe n the tips. That sounds great.. I am so glad to learn that this recipe worked out so well for you.. Thanks for sharing..